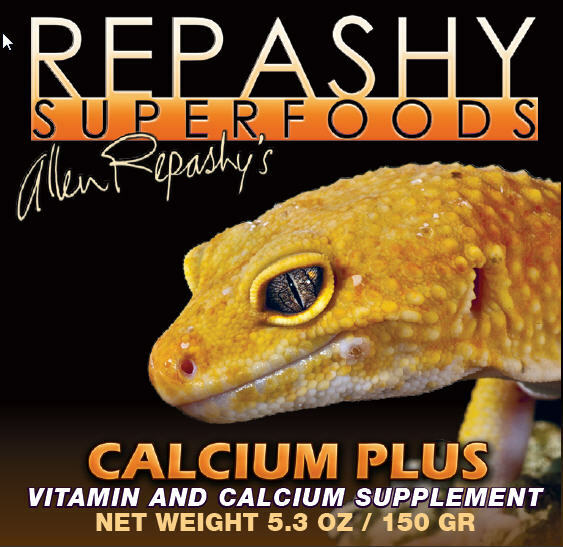 This article will give details on the use of Calcium and Vitamin D-3 in my "Repashy Superfoods" line of diets and supplements, and the research and studies involved. My particular focus for this article will be on Vitamin D, Calcium and Phosphorous. With my research, trials, and data collected I am able to explain why exactly I chose the inclusion levels, particular forms and the overall importance of Vitamin D, Calcium and Phosphorous included in my Superfoods. Excellent nutrition and husbandry must be combined together to insure reproductive success. One can be feeding the most perfectly balanced diet in existence, but without the optimum temperature gradient, that 'perfect' diet is not able to be digested. Reptiles are cold blooded animals, thus, they require heat in order to digest their meals. If this temperature requirement is not met the food will simply rot in the gut and not be digested, causing detrimental damage to the reptile. Digestion is not only impaired by improper heat requirements, but lack of hydration can have an affect on digestion as well. Water consumption is often overlooked when thinking about digestion, but without proper amounts of water intake the process of digestion can be halted, thus, causing damage to the reptile. In their natural habitat, reptiles are very efficient at conserving water and can live in quite arid lands, going for long periods of time without drinking. However, in this type of environment other factors must be made note of. Reptiles in their natural environment will escape the heat by retreating to deep burrows in the ground, which can be quite moist and cool. This humid microclimate can be very effective in keeping a reptile hydrated. Another example of water intake is through the ingestion of insects. Insects alone can provide a large amount of water to aid in the hydration of the reptile. The early morning dew that is apparent in many arid lands is yet another method of water consumption, and for the herbivores, they will get much of their hydration from consuming plant material. As you can see, besides the obvious rain and access to running water there are many other means in which a reptile can get the moisture it requires. Reptiles in their natural habitat have learned to adapt to natural ways of maintaining proper hydration. When housed in captivity the reptiles are not able to resort to most of the methods listed above, they are at the mercy of their keeper to provide them with the proper environment. Fast forward to the dry terrarium with glass sides, a screen top and a basking light….One person may call it a perfect habitat for a reptile, but someone else may call it a great appliance for making beef jerky! This may be a funny analogy but it is more fact than fiction. Even a desert adapted reptile can quickly become dehydrated and die in an enclosure like this. In a situation like this, it is up to the keeper to provide the moisture to the reptiles, and often, it is in an 'unnatural form' via misting, soaking, a water bowl or a combination of these methods. The point is, that a dehydrated reptile can not assimilate the best of meals, so without the proper hydration the absorption of nutrition suffers. Now that we understand that nutrition is only one part of the key to success, now I can begin breaking down the importance of nutrition. Vitamin D is one of the most important vitamins in reptile keeping, especially when the reptiles are indoors and without natural UV radiation. Most reptile keepers are familiar with Vitamin D in regards to calcium powder, which in most cases is used to 'dust' the insects, coating them with a fine white powder. It can also be used in other ways, such as being mixed into a salad for herbivores, sprinkled on a pellet diet, or in the case of my Superfoods mixed right into the powdered diet. Since reptiles are viewed more as a specialty pet, little research has been done in regards to their nutritional requirements. Thus, the guidelines for use of these products vary quite a bit amongst manufacturers, as does the inclusion ratio of Vitamin D to Calcium. The product degradation is also a major concern and factor to consider. There are various views on what vitamins should be mixed with a calcium supplement, and how the mixture of vitamins can be effected by the minerals. Although there are many views on this subject, very little research has been done mainly due to the fact that there is just not a competitive market for their foods like there is with dogs and cats. To most people, the keeping of Reptiles is not mainstream, which means that there is little monetary motivation to understanding their unique nutritional requirements. Let us however, take chickens for an example….There is a huge financial incentive to grow a chicken faster, make sure it is healthy, and has good fertility. The potential profit increase is what drives animal research, and this is the factor that will keep reptile research on the fringe. Reptile nutritional research is limited to a few dedicated people such as students who can choose their research, specialty Veterinarians and Nutritionists that have made it a personal passion, and a few larger specialty food manufacturers. Much of the results of these studies is proprietary, and is not available to the general public. The good news is, that is seems much of the avian research, specifically poultry, has been a good starting point for those of us who want to put an effort into the subject. If we take this knowledge and combine it with the reptile research that has been done, we have a pretty good start at reaching the reptiles nutritional requirements. To begin, one must become familiar with the term "DMB" (Dry Matter Basis). This allows one to compare "apples to apples" so to speak. If one wants to compare the nutritional value of two diets one must compare the values without moisture. For example; if one compares a dry dog food to a canned dog food by looking at calcium as a percentage of total weight, one must realize that there is a big difference in weight between the two due to all the water the canned diet contains. This water weight effectively dilutes the ratios, so to standardize comparisons, DMB is used. If the water is removed from the canned diet, then it can be compared equally to a dry diet (although the moisture in the dry diets must still be taken in to consideration as well). Take poultry for example again; the levels of Calcium in complete feeds range from 1-1.5% depending on the brand, and type of feed (starter, broiler, layer). This in fact correlates well with studies done with leopard geckos. Look at complete diet formulas from the large manufacturers that have done their own research, and it is seen that most complete reptile diets fall within these parameters. According to research, reference discussions, and from my own personal trials, calcium levels at and above around 2% can cause problems. Many people believe that there is no such thing as too much calcium in a reptile diet, especially when it is via supplementation. This is not true. Calcium in high doses can act as a binder, which inhibits the absorption of essential nutrients such as other essential minerals, as well as vitamins. In the presence of too much Vitamin D, excess Calcium can calcify the internal organs. As anyone who has ever taken calcium for indigestion should know, calcium neutralizes stomach acids, which are necessary for the digestion and absorption of all nutrients. Many drugs have warnings to not take them with an antacid because it can prevent the drug from being absorbed into the system. Balance is a major key. Giving a large dose of calcium all at once is not the same as giving a smaller amount with each feeding. Phosphorous and its relationship to calcium is also very important. It is generally agreed across the vertebrate world, that a inclusion ratio of 2:1 (calcium/phosphorous) is optimal. This is a common ratio measured in healthy bone analysis of most vertebrates. To err to the high side with calcium is generally much easier to metabolize than a diet that has less than a 2:1 ratio. Even a 3:1 ratio is metabolized efficiently by most organisms. The importance of calcium in reptile nutrition is of high concern. History shows us that calcium deficiency is a common problem, especially when the reptiles are pressured into longer than natural breeding seasons. As previously noted, this situation causes unnatural stress on female reptiles to produce more eggs, thus requiring more calcium. Remember however, that it is not just a lack of calcium that creates this problem, but a complex relationship between many vitamins and minerals. Taking the basic knowledge outlined above I started working on my diet and supplement formulations. First, I had to decide on an inclusion ratio for Calcium, and after considering personal experience, research information, and knowledge of herpetological goals and captive conditions, I decided to go with a high side of the range number, and use a 1.5% calcium as my inclusion ratio for a complete diet. Second, I had to decide what Vitamin D levels to use based on a complete diet. Vitamin D in the dietary form of D-3 can be toxic in excessive amounts, but per conversation with manufacturers, toxicity is not usually seen until 10X the normal dosage is approached. With this knowledge, and the fact that Vitamin D deficiency is much more of an issue with reptiles than toxicity, I would rather err to the high side. In personal trials, I studied inclusion ratios in Rhacodactylus geckos from 500 IU/KG to 8,000 IU/KG (DMB) in my complete MRP formula as fed exclusively to Rhacodactylus with no supplementation or substitution.. I saw classic symptoms of MBD in the 500 IU/KG group, and in a group fed 1,000 IU/KG there were marginal results. All geckos grew fine at early age, but at breeding age, females who began laying eggs would start out fine, but after a few clutches, would start to show signs of MBD, along with laying poorly calcified eggs. Diets with 2,000 IU/KG, 4,000 IU/KG and 6,000 IU/KG all worked equally well, and eliminated any signs of MBD in breeding and egg laying females for the term of the year studied. The group fed 8,000 IU/KG also appeared normal after half a breeding season, but due to the fact that the groups fed lesser amounts showed no significant differences, and the fact that I was approaching levels that could produce toxicity, I discontinued this group after six months. Based on this information, I originally settled into a feed level of 2000- 4,000 IU/KG as an "err to the high side" inclusion level. This is the level that has been used in my MRP complete diets since 1996, and it has proven from long term study of gecko tissue that it has produced absolutely no signs of toxicity in individual geckos that were fed these levels for 10 years. Compared to many diets out there, these levels of Vitamin D are on the average, a bit higher than other diets, but I believe that it has proven to be one of the key reasons for the success of the product and the positive feedback from consumers. Looking at past research, current products from reputable manufacturers, and combining these factors with my own experience, observation and personal communications, I have come up with a basic formula for inclusion levels of D3 in my complete reptile diets. My basic formula is 2,000 IU Vitamin D for each 1% of calcium in a complete diet. This is my baseline for formulation for determining the minimum concentration that I am using, and it is adjusted from there based on species, application, degradation, and type of product. Using this formula to look at my complete gecko diet would give us 2,000 IU X 1.5%, or an inclusion ratio of 3,000 IU/KG as a minimum.. This formula is not necessary for the development of complete diets, but we will see that it can be quite helpful in the development of supplement products. Based on the information provided thus far, I have come up with three parameters that I used in developing the rest of my products in relation to Calcium, Phosphorous, and Vitamin D on a DMB. Next, I looked at supplementl products. The most important being Vitamin/Mineral powders meant to be 'dusted' onto insects. There are many products on the market, Calcium with Vitamin D, Calcium without Vitamin D, Vitamin powders, and the 'All in one product', my "Calcium Plus ICB." I spent a lot of time looking at the products available. Researching the facts, fiction, and folklore about what was right and wrong. I also dedicated much time to analyzing ingredients, ratios, and reading the recommended usage instructions and claims of all the products on the market. A common practice in supplementation to date, is to alternate vitamin powder dusting with calcium powder dusting; three times a week with Calcium, three times a week with vitamins….Everyone seemed to have their own methods and beliefs. I decided to take a little more of a scientific approach to the dusting of insects. First, I decided to look at the cricket, since it is by far the most popular feeder insect to be dusted in this manner. I found several nutritional analysis of crickets, and averaging them out, came up with three important factors that I used for my calculations. I then decided to see how much of a superfine calcium powder would stick to a cricket. I took two groups of crickets; medium and large size. I weighed out 100 grams of live crickets, and dusted them. I then let them walk around in a tray for 5 minutes, and weighed them again. This determined how much calcium by weight was sticking to the insect. Averaging this out using multiple size crickets and multiple samples, the mean calcium stick was five grams of powder sticking to 100 grams of crickets. Using this information in conjunction with the Cricket Analysis, some very useful calculations can be made. First, if we look at 100 grams of crickets, we known that because they are 70% water (30% DMB), that there is 30 grams of material DMB. This allows us to easily calculate that we are sticking aprox 16% calcium by weight to the cricket. Looking at calcium carbonate in its mined form, an average of 36% can be used for the actual calcium content of the calcium carbonate. With this information, one can calculate that if 16% of calcium carbonate is sticking to the cricket, that the actual amount of calcium stuck to a cricket is approx 6%. A quick look at the analysis of a cricket (1% Phosphorous) shows that the cricket is now dusted in a 6:1 (Calcium/Phosphorous ratio). This is a ratio that is two to three times higher than optimal. If I err on the high side, the calcium carbonate powder can be cut down to 50%, which gives leaves us with a 2:1-3:1 Calcium/Phosphorous ratio on the dusted insects. Meaning our original dust needs to be about 50% Calcium carbonate, or 18% Calcium DMB. Using this information, and the formula I developed previously, now I am able to calculate the amount of Vitamin D needed to balance out the Calcium content of the dust. The dusted cricket contains approximately 3% Calcium DMB (using a dust that is 50% Calcium Carbonate). Take our formula of 3,000 IU/KG for a complete diet containing 1.5% Calcium that is being used in a complete diet, in order to that to keep this same ratio in our dusted cricket coated with 3% Calcium, we now require 6,000 IU/KG DMB to 'balance' the levels of Calcium to Vitamin D within the complete diet parameters developed earlier. Since the dust contains 50% Calcium Carbonate, this is equivalent to that of a pure Calcium Carbonate dust that contains 72,000 IU/KG. As we known, a cricket dusted with 100% Calcium carbonate would contain near 6 % Calcium DMB, which is a level that is out of balance with the Phosphorous content of the cricket, and high enough to impair normal gut absorption of nutrients. Not that I have decided that the optimal ratio of Calcium in the dusting powder is 50% I can move forward and decide what to do with the other 50% of its content. This 'space' can be filled with many ingredients that will improve its nutritional value. I have used this 'space' to include my vitamin premix that is used in my complete diets. The levels are balanced (using the 100:10:1 A: D:E ratio) to the Vitamin D content that was calculated for the dust, thus, the ratios are absolutely correct and there is no margin for error that you can get when supplementing vitamin and mineral powders separately. I also include three types of algae, which provide a great source of trace elements and beta-carotene. Haematococcus pluvialis is a red algae marketed by Cyaotech as "Naturose." It is the highest natural source of Astaxanthin, which are red pigments contained in the beta-carotene complex. I use a high amount of this very expensive product to insure the maximum color potential for can be reached by the reptiles. I also use Cyanotech's Spirulina Algae, which is far superior to the typical products that are irradiated and imported from China. A high quality type of kelp is also used to help provide trace elements from natural sources. Another special caroteoid called Oro-Glo is added, which provides the yellow end of the color spectrum and is added for potential color enhancement. These carotenoid pigments are very important in the expression of skin pigment colors in many species across the animal kingdom. Also included is a probiotic premix to aid in the absorption of nutrients and promote balanced intestinal flora. Wheat germ flour, whey isolate, and hemp flour are added for an amino acid boost, as well as natural sources of vitamins. A mixed tocopherol formula is added to prevent oxidation, and a bit of honey and natural flavor is includedto increase sensual attraction. All these ingredients are painstakingly sourced in the finest grinds available to insure a good stick to the insect. There is not a better formulated dust on the market, and there is no margin for error in usage because the need for combining supplements has been eliminated. By reducing the Calcium Carbonate level in the dust from a pure mixture to 50%, a more balanced final calcium ratio is can be achieved. The added essential vitamins, amino acids, trace elements, and probiotics that we use to fill the "space" allows us to add many important ingredients to the formula. The "Calcium Plus ICB" dust is truly an all in one product that takes the guesswork out of supplementation. Effectively combining a calcium supplement with a vitamin supplement can be done, but is much more tedious, and requires a lot of work. There are also relationships between vitamins and minerals, and supplementing them at separate times, can impair the effectiveness of either part. There is a statement that many people tend to take for granted about mixing vitamins and minerals together, and this statement needs to be addressed. "Calcium degrades vitamins, and they should not be mixed together" This has been accepted as common knowledge, but today, it is not necessarily the truth. Minerals CAN contribute to the degradation of vitamins, but the concerns many have about this issue have been dealt with by much advancement in the stability of vitamins that have been engineered to be much more stable than in the past. Today, vitamins can be coated or encapsulated into tiny beadlets that are quite stable and resistant to oxidation. In the last ten years, the advertised stability of many stabilized vitamin forms has increased to the point that it is equal to the shelf life of most supplements even if it is in a high calcium mixture. In fact, when a vitamin manufacturer sells a premix ( concentrated vitamin formula designed to be mixed into a feed) today, it always has some kind of a carrier that is mixed with it to create a certain feed ratio and flow characteristics, depending on the application. It is the common practice of the manufacturer I deal with (one of the best in the business) to use cellulose and Calcium Carbonate in the premix. My premixes use nearly 50% Calcium Carbonate as a carrier. I inquired about this degrading the vitamins, and was told that with today's vitamins, that there is absolutely no problem in this regard. Many will argue that vitamins and minerals must be kept and sold separate, but these same companies sell pure Calcium powder mixed with Vitamin D3. The bottom line, is that stability after one year will be reduced in a pure vitamin mix as well as a Calcuim/Vitamin powder. Unlike some supplements, the highest quality and most stable forms of vitamins are used in my products. Freshness is the key, and any supplement should be used within a year of manufacture, just as with any complete diet. Effectiveness after this time may still be just fine, and it is not necessary to throw it away as soon as it is over a year old, but nutritional it is important to keep in mind that the nutritional value will begin to decrease slowly as time passes on. The ideal situation would be to use any supplement or diet within a year and refrigerate even unopened containers if possible to help extend the freshness of the product. Feel free to link to this article, but it may not be used, re-posted, or copied in any way. All content is ©Allen Repashy. For more information and the open discussion of Reptile Diet, Supplements, and Nutrition. Please visit my forum that is dedicated to these topics.